When Henry Wellcome died, the bulk of his estate and his collection was bequeathed to a body of trustees, who formed the Wellcome Trust. Their primary duty was to use the income generated by the company to support ongoing biomedical research, but they were also charged with fostering the study of medical history through the care and maintenance of the collections. A programme of sorting and rationalising therefore, was begun, which lasted throughout the 1940s and beyond. The Wellcome Trust's activities around the history of medicine, and on the public understanding of science, were brought together in 1998 to create a new Medicine, Society, and History Division. Recognising a wider remit than history of medicine only, the library is part of Wellcome Collection and aims to promote both the history and understanding of medicine. Comprises 12,000 manuscripts and 4,000 printed books in 43 different languages - the collection includes more than 1,000 manuscripts written on palm leaves, and others transcribed on silk, ivory, metal, bone, bamboo and tree bark. A medical prescription from ancient Egypt, written on papyrus (c.1100 BCE), is the oldest document in the Wellcome Library. Approximately 60,000 pre-1851 rare books including c. 600 incunabula (books printed before 1501) and c. 5000 books from the 16th century - all aspects of medical science and practice are represented, and there are wide and varied holdings in allied subjects. More than 100,000 prints, drawings, paintings, photographs and other media, ranging from the 14th century to the present day, and geographically from Japan and China in the east through Tibet and India to Turkey, Europe and the Americas, with smaller collections dealing with Africa and Australasia - in accordance with Wellcome's philosophy, the works show the historical and cultural contexts of medicine as well as internal developments in medical techniques and practices. More than 4,000 films and videos and 1,500 audio tapes, both broadcast and non-broadcast, covering the many and varied aspects of medicine: social and clinical areas of science, historical and current topics, physical and psychological aspects of health and surgery. Some of these titles are available through a YouTube channel. 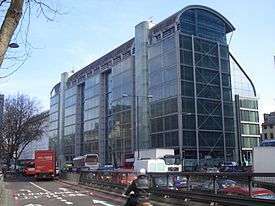 From May 2016, the Wellcome Library are host to a Wikimedian in Residence, jointly supported by Wikimedia UK. A project page details the Residency, the aims of which include improving the visibility and use of images from the Wellcome uploaded to Wikimedia Commons, training staff and visitors how to edit, and helping to improve medicine and history of medicine content on Wiki-projects (particularly pages on mental health). ↑ "British Psychological Society Archive". Catalogue. Wellcome Library. Retrieved 9 February 2016. ↑ "Neonatal Society". Catalogue. Wellcome Library. Retrieved 9 February 2016. ↑ "The Physiological Society". Catalogue. Wellcome Library. Retrieved 10 February 2016. ↑ "Wellcome Library Moving Image and Sound Collections". ↑ "Use of Wellcome Images". ↑ Harkins, Phoebe. "Wikimedian in Residence at the Wellcome Library". Wellcome Library Blog. Wellcome Library. Retrieved 8 August 2016.